Have you ever wondered what the first three rules of ​finding profitable niches for drop shipping are? Have you been left scratching your head, thinking that maybe drop shipping isn’t for you? If so, this is some vital information that will get you prepared to turn your drop shipping business around. 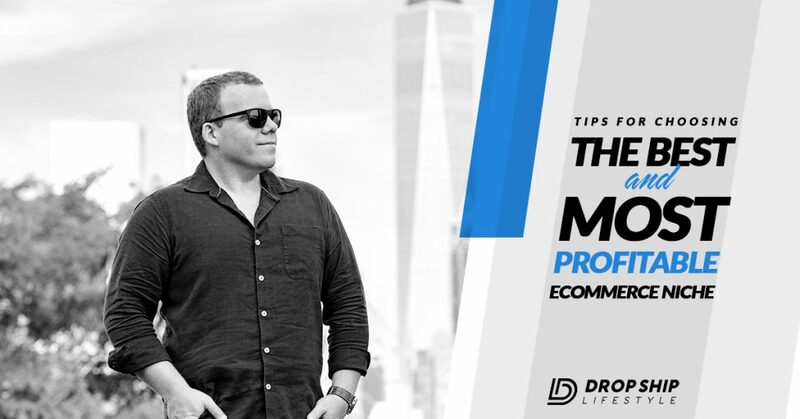 Discover the three criteria ​Anton uses to find profitable niches that will have you making a full-time living off your eCommerce store. You may be surprised at what they are… and we can guarantee you will use this information for years to come! So, you’re ready to start an eCommerce drop ship business. Congratulations! The first step is the biggest one of all. That step is not just saying that you “want to start an online business” but actually taking action and moving towards getting your first sale. One of the largest mistakes that is made when starting an eCommerce drop shipping business is not enough research. Many times at first glance, a niche can look like a gold mine ready to start bringing in the big bucks. But, after some diligent research it can quickly be found to be infiltrated and overrun with competitors. This would mean very little profit, and the opposite of your goal. Anton will explain the tips to avoid this costly mistake. Here are three great tips from Anton on selecting the right niche while keeping three of the most important things in mind: Price, Target Market, and Brand Loyalty! The first step of the drop shipping process is called “Niche Selection”. This section will cover the first step towards building a profitable eCommerce business by choosing your niche. A good niche will meet three prices of criteria: it will fall into our target price range, it will appeal to the upper-middle class, and consumers will have no brand loyalty which we will be explained in-depth later. When selecting a niche for a new eCommerce store you should look for a set of products that meet certain criteria. Anton constantly reminds us of how important it is to do this profitably. How to choose profitable niches and how it can actually be easy. ​Now, the problem is you can still make money if you do it the wrong way. Except it will be a lot harder to get to your desired outcome. Which I guess is making a full-time living, right? 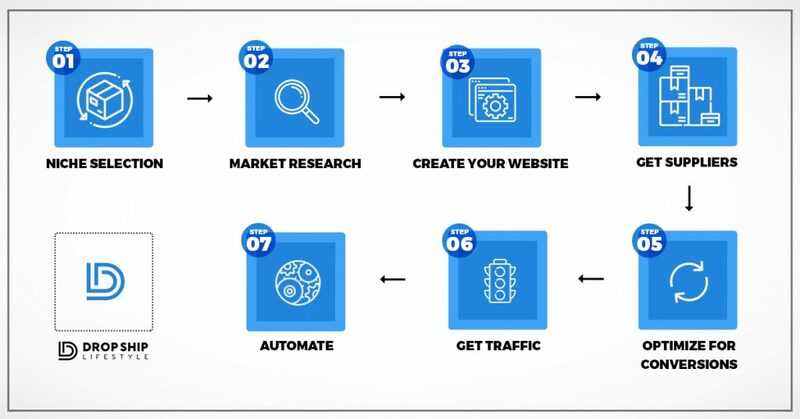 Making a lot of money with eCommerce..
Below are three tips from Anton, and he will better explain the tips and strategies to nail picking the best niche for you. 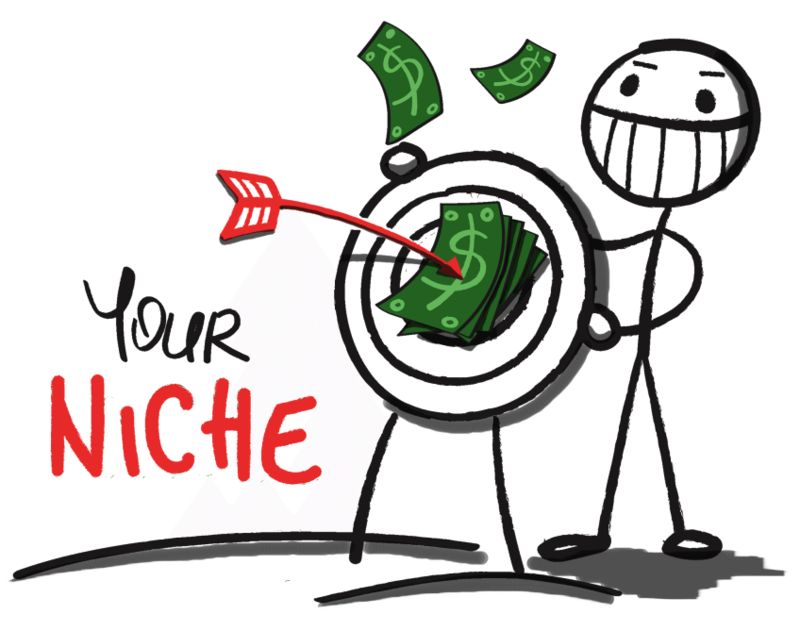 There are three tips for selecting a profitable niche that will actually make money. Now, here are a few pieces of criteria I look for. The first thing is always the price. That means product’s price, what you’re going to sell this product for. The average product price should be $200 or more. This is because your average profit margin (when you are drop shipping and using our method) will be about 20% of the gross revenue. What does that mean in practice? Well, if you sold something like a water bottle, that’s not at least $200. So that is not going to be a niche that I recommend get involved with. The same amount of time will go into processing an order for $20 as it will for processing an order for $200 or $2,000. If you’re going to be doing the work you might as well have a chance of making some real money on each sale. It is important to note that although I do have websites that sell products for $999 and up, I have noticed customers placing an order that large prefer to call in to place their orders. If you are comfortable on the phone, then this will not be a problem, but if you want to run an online store where the majority of orders come in before the customer even contacts you, I would recommend selling items priced between $200 and $700. Now, on the other hand, if it is something like a cell phone, that’s more than $200. That would pass the price test, but it would not pass the third test that you’ll hear about later. I have sold products online that appeal to the wealthy, products that appeal to the middle class, and products that appeal to lower income households. From all of my experience, I have learned that it is best to appeal to the upper-middle class, meaning online shoppers who have a household income of $100,000 or more. It’s sad to say but if you sell products that appeal to low-income households you will have a lot more work to do. Once we make sure our price is above $200, we look towards our target market. Now, if you are involved with marketing at all (if you ever studied marketing) you’re familiar with demographics. And the truth is you could break up the world into probably a billion different demographics. When people don’t have enough money or spend their last dollar to buy your products, you better believe they are going to have more questions. They are going to be inspecting the items more carefully. If anything is wrong or even if they think anything is wrong, you are going to hear about it non-stop. With the wealthy, it’s the same thing. When they are investing money or buying products, they expect a certain level of customer service that requires really a different type of business owner. But, just expect that if you’re going to go that route, you are going to be more of a concierge rather than someone that makes money online. Again, that is why when we are looking at demographics. Remember, stick with the upper-middle class. I define that as having a combined household income of above $100,000 U.S. dollars. When people have that kind of money, they are very comfortable with spending online. They are used to buying items that are $200 or more. They are not going to be calling or emailing you as much. So again, this demographic makes niche selection a lot easier. It makes your business run a lot smoother. It makes it a lot more profitable if you choose niches that fall into that target demographic. If that’s who the products appeal to. The final tip from Anton is just as important as the first two regarding your target demographic and pricing. Now, we will talk about brand loyalty. As was mentioned earlier that while cell phones fall into the price range criteria, they don’t meet one of my other criteria and that is because of the brand loyalty. When someone is going to buy a cell phone, in general, they are going to buy an iPhone or they are going to buy another Android phone, they pretty much already have a brand in their head of what product they want. Same thing with people that are going to buy headphones. There is probably four or five big headphone companies. Right? There is Sony, there is Bose, there are Beats, and there is Sennheiser. There are all these big companies and people already know what they are going to buy. So the third thing that you are going to look for when trying to choose a profitable niche is to pick an industry that has no brand loyalty. It’s going to make a big difference. That’s because if you try to sell in a niche where people already know what company they want to buy from, it’s going to make it that much harder for you to get dropship suppliers. Harder for you to actually be able to sell these products, for you to be able to compete in terms of price. It’s impossible. Remember The Target Market for eCommerce Niches Are Vital! After ten years of experience selling products online, I’ve realized that selling products to low-income households require much more pre-selling, more customer interaction, and more complaints/returns. The same can be said about selling to the wealthy. They expect more personalized service and require much more of an effort to close the sale. We are looking to start a business that requires as little effort as possible while generating the most sales possible. We are looking to sell to single people or families with disposable income who are used to shopping online and comfortable making large purchases over the internet. What kind of computer or cell phone do you have? Is it the same kind of brand as your last one? Chances are if you own a Mac, the next computer you buy will also be a Mac. For example, I wouldn’t try to sell TVs online. Most customers who are buying a TV do the research on which TV is best for them or purchase the same brand TV they have had in the past. They already have researched which TV brand has the best picture quality, the best warranty, and the best reviews online. If I wanted to sell the TVs that people are actually buying (Sonys, Panasonics, LGs, etc) there is no way I would get approved for an account with the same payment and pricing terms as Best Buy or any other big box stores. Let’s say I live on a lake and I decide I want to get into stand-up paddle boarding. I know I need a paddle board and a paddle but I have no prior knowledge of this sport or what brands are well known. I could care less what company makes the board as long as I can find some good reviews and the price is right. This is a great example of a product to sell online. The average cost of a stand-up paddle board and the paddle is over $700, the average customer does not care what brand they are buying, and this sport is likely to appeal to the upper-middle class and would be purchased with disposable income. Mr. and Mrs. Smith move into a new home, there is a huge chandelier that hangs in the entryway. Mrs. Smith hates it. They go to the local The Home Depot & Lowe’s but can not find a replacement that they agree on. They know what style they are looking for but they can not find it locally. Mrs. Smith goes online and searches for a 30” x 30” entryway chandelier. She finds a website with hundreds of options including one that she and husband can agree upon. ​This is another great example of a product to sell online. 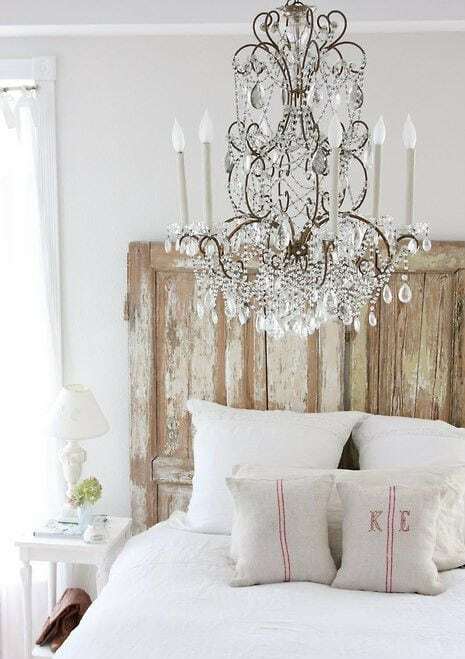 Chandeliers are expensive, they appeal to the upper-middle class, and the average customer does not care what brand they are buying as long as they like what they see. ​Take some time now to think about other products that meet these criteria. Write a list of as many product types as you can think of. ​If you’re crunched for time, let us help you by providing you with some niche ideas. Click here to get the niches. These are some excellent first tips that are sure to be valuable and help in honing your strategy when choosing the right eCommerce niche. 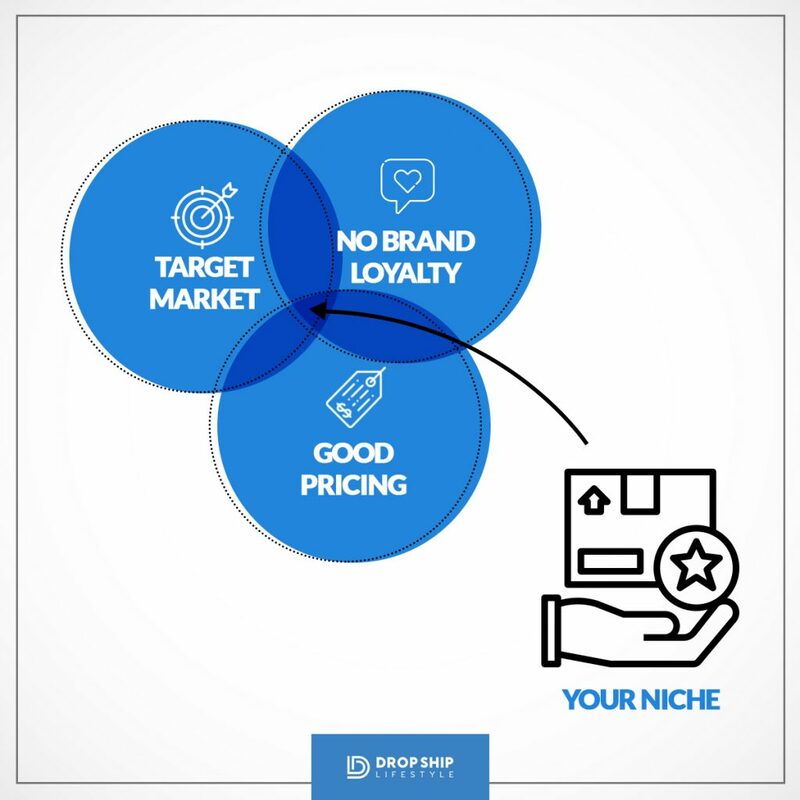 Remember that these three rules for profitable and effective eCommerce niche selection are crucial: the target price, the target demographic, and brand loyalty cannot exist - because if it does it is going to make your life and eCommerce drop shipping business a lot harder. Now that you have the three criteria you can start tracking down your own profitable niche. To help you absolutely nail niche selection download our 187 niche ideas. With this idea-packed resource, you’ll find the perfect niche for your store and start your journey to a better life through drop shipping. I do not recommend using my niche selection guidelines for doing research for eBay… in fact, I don’t recommend selling on eBay at all. Thank you very much for all these useful information, it actually changed the way i think about eCommerce entirely. It made me believe I can do it. I’m actually new and I already registered for your Webinar which I await till tomorrow. I just want an assurance after the webinar I will find it easy and straight to start a drop-shipping online store and get visitors and more sales. And I hope my location is not a barrier, because I’m from Nigeria. How much do you charge to start a drop ship business and then I would buy it from you? If you enroll the Drop Ship Lifestyle Ultimate Package our team will build your site for you. Do you sell these existing stores? Yes, we do! Many of our students sell theirs as well. You can learn more in our private Facebook group. So I really like the idea of high end hobbies as a niche. My question is should I limit my Shopify store to 1 particular hobby, for example, stand up paddle boarding with the addition of those smaller on going purchases (whatever those may be in stand up paddle boarding) as you mentioned as opposed to say, bow hunting, stand up paddle boarding and scuba diving or maybe other high end hobbies with more of a connection? The 3 examples I used were just off the top of my head. So I guess im asking is one store, one hobby a better rule of thumb? Thank you for the excellent free tutorial! I have a question – Should we stick with only one niche product family per store, or we can sell more than one niche product kind in order to increase number of products. And how many products even from one niche I should list in my store, approx.? When building your niche store, you want to offer all of the products that meet your criteria. For example, if your niche was standup paddle boards, you would want to sell all standup paddle boards that cost over $400 (to compensate for the shipping cost). I want to start by thanking you for this free informative post. Answered a lot FAQ and you seem very genuine. I am thanking you on behalf of everyone who have read this post. I’m fairly new to drop shipping, We all know this can be a very profitable business as well as it can be very tedious. 1. I have 40k capital to spend on my eCommerce business. Do you think the better route would be to start drop shipping, or finding a niche I am fond of and actually take in inventory and sell them through website/shopify for maximum profit. 2. I have a hard time finding a niche, I don’t want to make a mistake with the money I have. Also, I see you’ve stated that searching for a supplier in the states makes it much more smooth in terms of faster shipping and easier communication. How do I go about finding a supplier in the states after I’ve round what i want to sell through shopify. 3. Last question, Once i find the products I’d like to drop ship, do I then label them as my own brand, or continue to sell them through their name label. Thank you so much, and again, fantastic post for the newcomers! Q. I have 40k capital to spend on my eCommerce business. Do you think the better route would be to start drop shipping, or finding a niche I am fond of and actually take in inventory and sell them through website/shopify for maximum profit. A. I think you’re best off to start with drop shipping. You can drop ship in the niche in which you’re interested in taking inventory in. By doing this you can gain sales (and profit) while learning what the market wants. This way you be sure to choose the best products for when you decide to hold inventory. Q. I have a hard time finding a niche, I don’t want to make a mistake with the money I have. Also, I see you’ve stated that searching for a supplier in the states makes it much more smooth in terms of faster shipping and easier communication. How do I go about finding a supplier in the states after I’ve round what i want to sell through shopify. A. If you’re not yet a member of Drop Ship Lifestyle, you should go ahead and enroll right now. You’ll get access to our niche selection training as well as our niche selection verification so you can be sure you’re not wasting time and money. Q. Last question, Once I find the products I’d like to drop ship, do I then label them as my own brand, or continue to sell them through their name label. Good luck and I hope to see you in Drop Ship Lifestyle! Hey, Anton 🙂 Great stuff man. I really enjoyed your dropshipping mini-course and niche selection course. I’m a newcomer to this whole ecommerce/shopify thing. I find the business model to be really interesting. My question deals with how you keep track of your monthly sales and costs of orders (total sales, gross margin, net profit, ad spend, etc.) Do you use a special spreadsheet for this? Is this also something you teach in your core product, DSL 6.0? Glad to hear you got value from the drop shipping mini-course! Hi! I want to know that from how much money we can start this dropshipping business including all sourcing materials to marketing. i can speak basic english my english is not that fluent is this will become barrier for dropshipping? Regarding English being your second language, my advice would be to communicate with suppliers and customers via email and use a tool like Grammarly to check for errors. Thanks for make sense out of this! I”ve been struggling with niche selection for way too long and this blog post really resonated with me. I’m wanting to start dropshipping. CAn you point me to where or how I start? 1. I am going to be selling musical instruments which can be very expensive within an especially within the guidelines that you have given in the article. How does one sell expensive articles and automate the process within Shopify? 2. I know that you do not like dropshipping to AliExpress, however most of their items can be sold and automated through oberlo, what do you think about selling lesser priced items that way? 3. How do you feel about selling T-shirts when there are number of Print on demand companies that will integrate with Shopify and automate the process from order to shipment? It seems that the only thing that would be necessary and time-consuming would be to design the shirts and upload them to one of the companies. I have been thinking about doing this as I have her number of ideas for shirts and it seemed that it would be a pretty painless way to do it. I would appreciate it if you would give us your opinion about my questions and ideas. Glad to hear you’re loving Drop Ship Lifestyle! The process of selling expensive items is the same as selling cheap items. You just make more money 🙂 Regarding automation, you should use the Drop Ship Lifestyle Shopify app which forwards orders direct to your supplier(s). Once you build a brand it makes sense to add products like print on demand T-Shirts. However, I’d focus on selling expensive products until you’re making money 🙂 You can then expand on your business from there. Thanks for all the info,But I was wondering,I’m not from the states, and I’m limited to epacket shipments ,How can I sell high price products? Do you have a system for low priced products too? Good question! First off – we do not worry about epacket shipments or anything like that because we do not drop ship from AliExpress. We ship from suppliers in the states, to customers in the states, and you can do the same. I love your material. You seem like you genuinely care about people, and want to help. But im confused, your “competitor” says to sell products between $15-$85, for impulse buying. Both of you are very knowledgeable, can you provide insight on both target markets? We focus on selling expensive items so we can make more money every time we get a sale. It’s just as easy to sell as a $850 item as it is to sell a $85 item. In one scenario you’d NET around $210… in the other you’d NET about $20 bucks. Thanks Anton, your advice is really helpful. Passion can really distract. I have passion about Jewelry, but look like the price range is not above $200 or even $100. How should I go then? How can we know which group of audience have income above 200K? I’d be happy to help but I’m not seeing any emails from you in my inbox…. try [email protected] Thanks! You’re welcome 🙂 Thanks for the feedback. For clarity, does the niche have to be entirely expensive, or are we just offering the more expensive products within the niche? Hi Anton, I noticed in the above example in the Google search engine there is an extension/tool that comes up with every search result that shows statistics… it looks very handy, what is that and how can I get it? It’s called SEOQUAKE. I wouldn’t recommend it though. We have uninstalled it since recording that .gif. My question in relation to your article is this: yiu mentioned paddle board and chandelier as examples. I’ve had some good ideas but I keep asking myself which products someone is more apt to buy online than in store. I know myself, if I was buying a paddle board or chandelier I’d be going to a brick and mortar store, not shopping online. I’ve done all kinds of research on trends, age groups, gender, dollars spent online, yiu get the picture. How can I be confident I’m choosing a niche that a) people will buy online b)be confident i’ll find a supplier? (I spent so much time choosing these niches and contacting suppliers/manufacturers and came up empty handed and now have to start from scratch again doing more research to choose a niche and then start contacting companies again. Any help would be appreciated! P.S. When you say you’ve been financially successful at dropshipping are you sure your success isn’t more from the funds you make selling your tips and tricks to us newbies? It’s hard for me to say why everyone is denying you without seeing your online store and without knowing your approach to contacting them. We have a very specific approach that we use when doing our market research, when finding our suppliers, when building our websites, when reaching out to these suppliers, and then when following up with these suppliers. There are typically a lot of things that you have to do right before getting approved… I’m not saying this is why you are getting denied, but if your website looks unprofessional and all you’re doing is calling suppliers and asking if they drop ship I would assume that they would just say no. Best of luck on your venture! As many of you already know I created Drop Ship Lifestyle after selling a network of eCommerce stores and then trying to find a community of other store owners to network with… What I found was a bunch of scammers who promised newbies they would get rich quick by following their push button systems! This lead me create a new community along with online training that shares how to build a REAL online business. I’d love to hear what you think… it’s 10 video training modules designed to help you drop ship profitably… all for free. If you go through the “What Is Drop Shipping?” mini-course and still have questions just contact me and I will help you out. Hi Anton,thanks for all the info so far, i am living in Spain and would like to dropship in several countries around the world,however it seems that your advice is to dropship in your own country (local), do i need to have a separate shop for every country? I’m not sure how shipping costs change from country to country in the EU… but if it’s not much more expensive to ship to a neighboring country then you should go ahead and sell to them. you say that we should target items from $200 and higher i assume this is for physical stuffs,i’m in info products,what is your price range for this? That’s correct. This article is about selling physical products. Selling info products is totally different game. You can learn more here: http://www.membershipsitemasters.com/ Thank you!